This morning I listened in while Anthony watched a video from one of his favourite YouTuber’s Ze Frank. It really resonated with me, because sometimes I get so stuck in my head, that I forget to enjoy my life, to just live and be happy. Ze Frank talks about how happiness is often made up of small gestures, small acts, the simple things in life that we enjoy but take for granted. Happiness is practising these things in a way that is mindful of them and the joy that they bring. – writing this blog entry, right now. 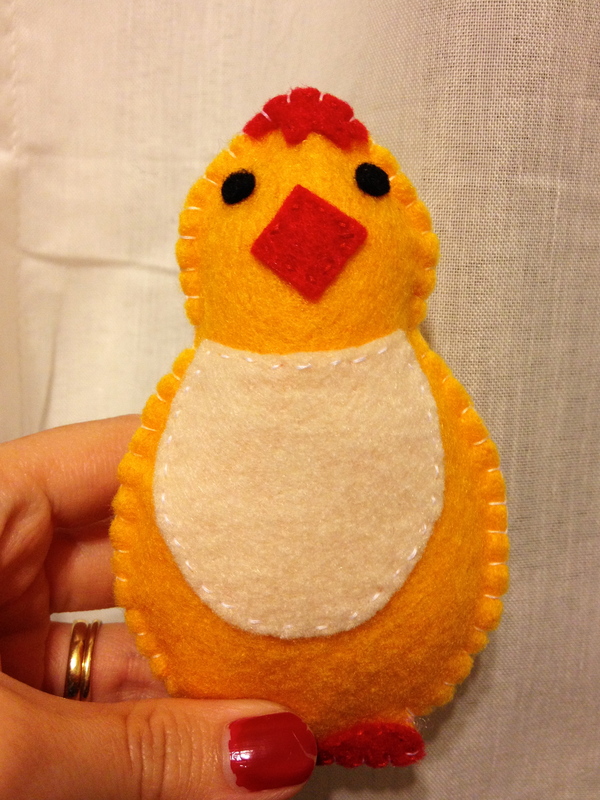 Today I sewed a Chick plushy. Making him (lets call him Gerald) gave me happiness. Not immense happiness in itself, but that’s ok. Maybe all those small acts of happiness from today and the days to come are what’s going to make me happier in general. Maybe I don’t need to keep searching and hoping for some future period of happiness. Because it’s here right now, in the life that I have. Reading this blog every day is a moment of happiness 🙂 You should be so proud to provide that, every single day, without fail. Even the not so happy ones provide joy because something good (your craft) has come out of it. And the Chickie is very cute! Thank you lovely Bec! I think you’re pretty fab too! Wow! Thanks for making me reflect… sure is amazing what we take for granted- HECK! There are so many things that make me happy and I feel happy most of the time. I think there are too many things for me to pick from to put on a list! Food also makes me happy! Although afterwards, it makes me sad..